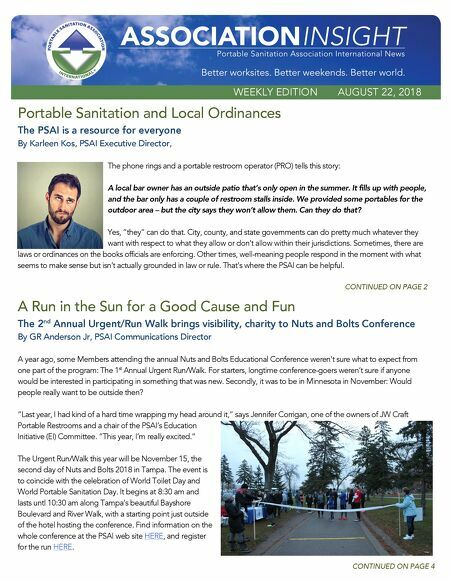 WEEKLY EDITION AUGUST 22, 2018 Portable Sanitation and Local Ordinances The PSAI is a resource for everyone By Karleen Kos, PSAI Executive Directo r, The phone rings and a portable restroom operator (PRO) tells this story: A local bar owner has an outside patio that's only open in the summer. It fills up with people, and the bar only has a couple of restroom stalls inside. We provided some portab les for the outdoor area – but the city says they won't allow them. Can they do that? Yes, "they" can do that. City, county, and state governments can do pretty much whatever they want with respect to what they allow or don't allow within their jurisdict ions. Sometimes, there are laws or ordinances on the books officials are enforcing. Other times, well - meaning people respond in the moment with what seems to make sense but isn't actually grounded in law or rule. That's where the PSAI can be helpful. CONTINUED ON PAGE 2 CONTINUED ON PAGE 4 A Run in the Sun for a Good Cause and Fun The 2 nd Annual Urgent/Run Walk brings visibility, charity to Nuts and Bolts Conference By GR Anderson Jr, PSAI Communications Director A year ago, some Mem bers attending the annual Nuts and Bolts Educational Conference weren't sure what to expect from one part of the program: The 1 st Annual Urgent Run/Walk. For starters, longtime conference - goers weren't sure if anyone would be interested in participating in something that was new. Secondly, it was to be in Minnesota in November: Would people really want to be outside then? "Last year, I had kind of a hard time wrapping my head around it," says Jennifer Corrigan, one of the owners of JW Craft Portable Restro oms and a chair of the PSAI's Education Initiative (EI) Committee. "This year, I'm really excited." The Urgent Run/Walk this year will be November 15, the second day of Nuts and Bolts 2018 in Tampa. The event is to coincide with the celebration of World T oilet Day and World Portable Sanitation Day. It begins at 8:30 am and lasts untl 10:30 am along Tampa's beautiful Bayshore Boulevard and River Walk, with a starting point just outside of the hotel hosting the conference. Find info rmation on the whole confe rence at the PSAI web site HERE , and register for the run HERE .